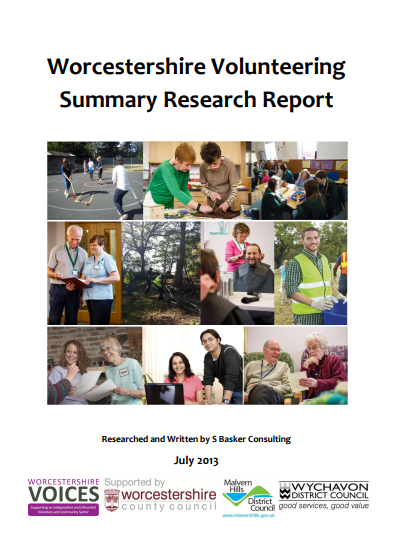 This research was commissioned by Worcestershire Voices. It was conducted between March and July 2013. The findings are drawn from the results of two surveys (one with organisations and one with members of the general public), interviews with key stakeholders; desk research and focus groups. 47% give unpaid help as an individual to neighbours, friends and people in their communities (informal volunteering). Volunteering roots people in their communities and creates stronger social networks and a more cohesive society. "Volunteering can provide a ‘heart’ to the community". In the face of economic downturn, cuts in services and increased unemployment and hardship there’s a clear need for communities to be more resilient and supportive.